It is Thanksgiving week. Are there things you look forward to the most like the laughter, a pretty set table or an excuse to eat multiple pieces of pie? Maybe you love being the favorite aunt (moi), making gingerbread houses and cleaning someone else’s kitchen. I think most people like Thanksgiving because the menu is pretty much set in stone. You have a turkey, stuffing/dressing, a green veggie, sweet potatoes and mashed potatoes. Don’t forget the rolls, cranberries and pies are also on the list. You can’t miss those or everyone is going to talk about you. It is like the holiday is filled with pressure. Maybe you don’t like turkey but you KNOW you have to serve it because what is Thanksgiving without a bird! It doesn’t matter that you hate the process of cooking a whole turkey you HAVE to do it. And lord help the person who thinks they can just put a turkey breast on the table! People will turn on you quickly! 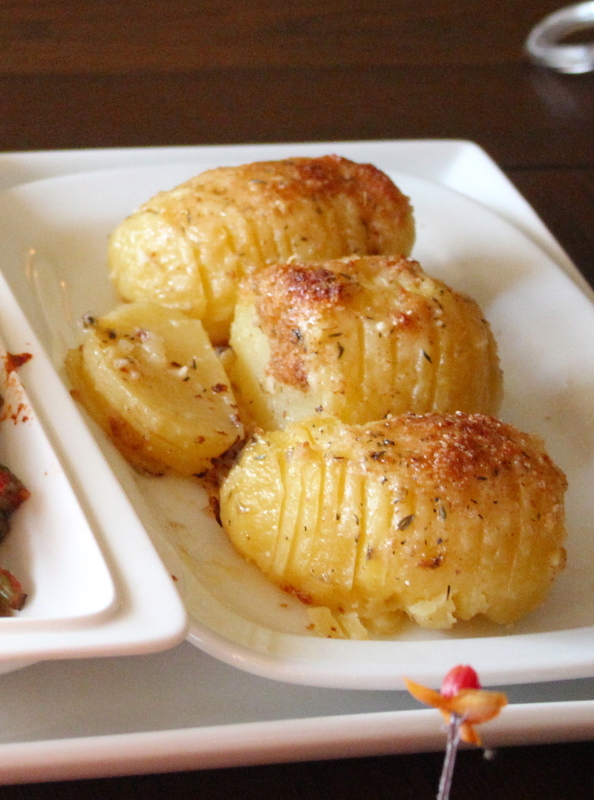 I think this year we should pressure our hosts into serving hasselback potatoes. They are actually easier than mashed potatoes and so much prettier. If you’ve never hasselbacked before I’ll make it easy. Think of them like a big fan. As they cook, the cut sections fan out and the butter seep into each crevice. You can get really make it a showstopper and add a little cheese, herbs or bacon halfway through cooking. These babies will come out of the oven and your guest will never think of Thanksgiving potatoes the same again. In a small bowl, combine your “array”. Think that each potato is going to need about 1 full Tablespoon of toppings. To make it stick, add a drizzle of butter. Set aside. Slice a thin slice off the bottom of potato so it is level and does not wobble when you are trying to slice it. Place the potatoes in a baking dish. Cover your dish with foil and bake for 30 minutes. 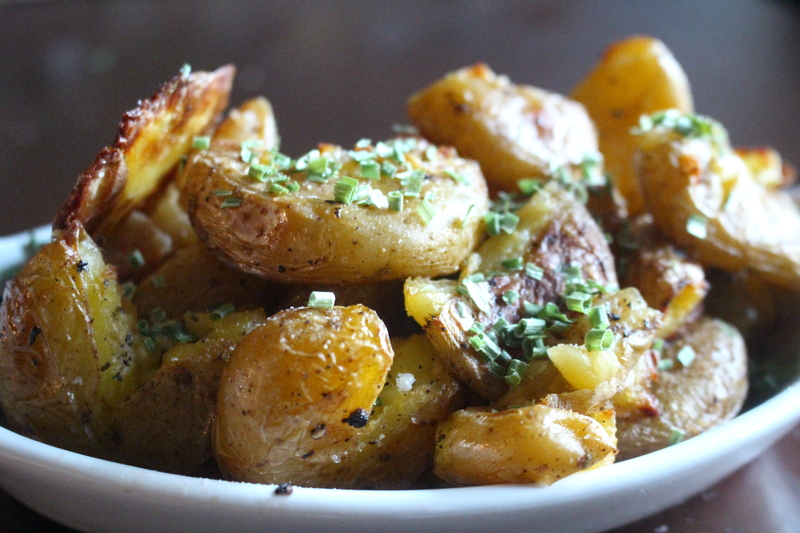 At the 30 minute mark, remove from oven and smush your array of toppings on potatoes. 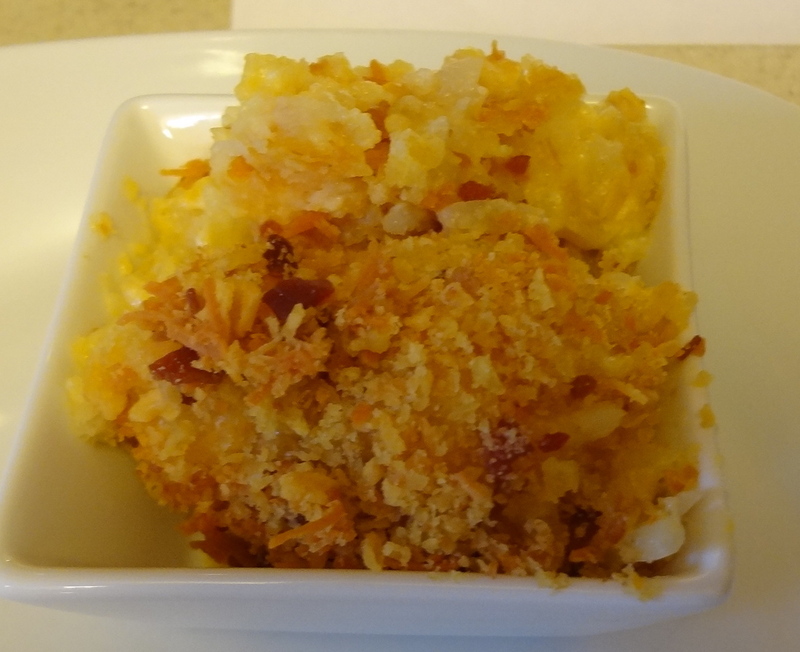 Recover the potato dish with foil and bake another 30 minutes. When they come out of the oven, they should be fork tender. If they aren’t tender, bake a little longer. Serve on a platter with nothing on….the platter. You should have on clothes because even if you are a stripper no one wants to watch you eat naked. I have tried these, but the didn’t fan……now, I know why! hooray. For those who are not a fan of a whole bird, try a turkey roulade (Ina has a great recipe). There will be no name calling, because it is an amazing dish. Your posts are amazing. Thank you for thinking outside of the box/ pole. haha. Strippers and fanned potatoes? What the heck did your family (read Mom and Dad) do to you, poor gal? On brighter note, the “potates” look delicious! I was laughing as I was writing it. I think I have some wires misconnected in my head! I would like a Thanksgiving lasagna. 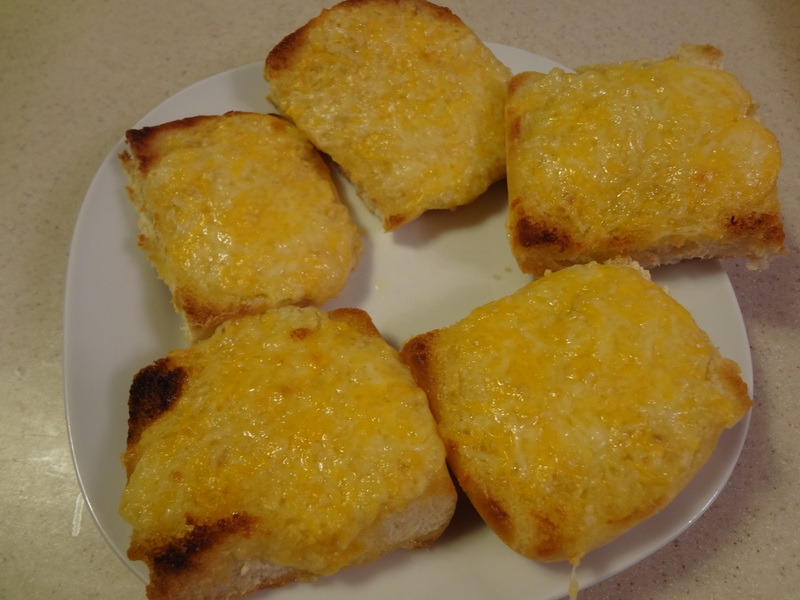 I like those sides (salad, garlic bread) so much better!